A university student was recently removed from Southwest Airlines flight in California when another passenger became unnerved and reported him to the authorities after he conducting a telephone conversation in Arabic. Khairuldeen Makhzoomi, 26, a senior at University of California Berkley, said that on April 6 he was taken off a plane that was about to depart from Los Angeles to Oakland after speaking to his uncle on a mobile phone during boarding. He was later taken into custody and interviewed by the FBI. Makhzoomi’s removal and detainment was spurred by another passenger, who reported “potentially threatening comments made aboard our aircraft” according to a statement released by Southwest and obtained by the Guardian. Zahra Billo, executive director of the San Francisco chapter of the Council on American-Islamic Relations, told the Chronicle that Makhzoomi’s incident was just one among many targeting the Muslim community based on racial profiling. “We’re concerned that this is part of a trend of Muslims being profiled and their right to travel being impacted,” Billo said. 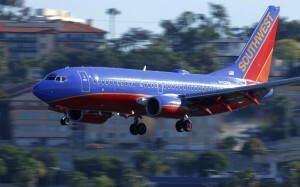 Makhzoomi said he did not plan to file legal action against Southwest Airlines.